Hearing aid technology has improved drastically over the past couple of decades. Early devices relied on vacuum tubes and bulky batteries, but today’s instruments take advantage of digital signal processing, microchips and computerization. Keeping track of the latest technological features can be challenging, but we’ll cover a few of the more popular options here. Analog technology still exists, but fewer and fewer manufacturers offer these devices, and many have phased them out entirely. Analog units employ a particular frequency based on your audiogram and all sounds are amplified in the same manner, whether speech or background noise. 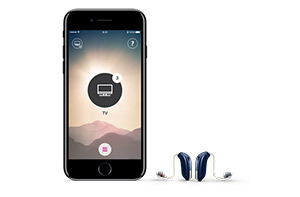 Some analog hearing aids can be programmed for different listening environments. Gain processing reduces background sounds and microphone noise to offer a clearer sound for the listener, with less clinical adjustment needed. Digital feedback reduction (DFR) relies on cancellation systems to eliminate or reduce feedback. Digital noise reduction (DNR) reduces background noises for improved speech recognition. Directional microphones utilize dual microphones, focusing one on the sound source while the other decreases background noise, to enable the user to better determine directionality. Wireless connectivity with Bluetooth® devices provides great flexibility. While the choices may seem overwhelming, working closely with your audiologist at Robertson Hearing Clinic can help you figure out which technology and features are perfect for your needs.